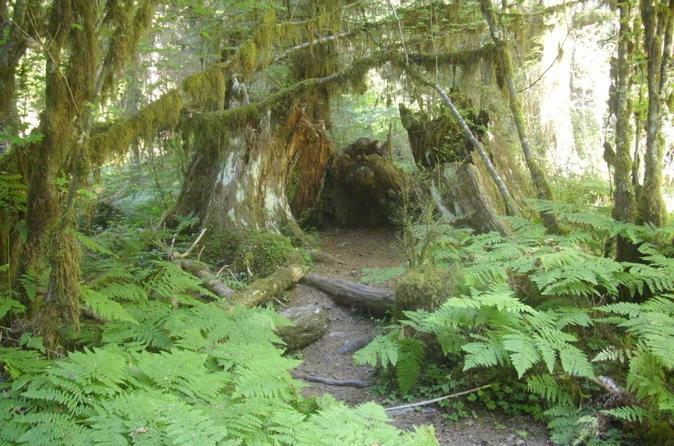 On the Olympic Peninsula, the lush ferns and mosses will make you forget the real world. This tour includes a visit to a Pacific Ocean beach, and two walks through easy trails in the forest. There are plenty of stops for restrooms and stretching, and small local stores for snacks. This full day tour begins at 7:00am and ends at 7:00pm. You and your driver guide will depart Seattle in the morning for a full 12-plus hour day. It is a 3.5 hour drive to the first stop in the Quinault Rain Forest, but once you are there, it's fun time. Walk the first trail, then go see the world's largest Spruce tree. There are many of the nation's largest trees in this forest. Next, a waterfall viewing and photo stop, then lunch. After lunch, you'll visit the Pacific Ocean with driftwood and sandy beaches, then make your way to the 2nd trail head. This trail is lush and meanders along a wooded stream, with moss galore. On the road there and back you'll stop in Aberdeen for a rest break. Kurt Cobain of Nirvana was born here and the sign entering the city says 'Come as you are'.